No need for touch-ups throughout the day. This the oily acne skin girl sharing with you again (see my previous reviews here and here). First and foremost, the colours in this palette (010 Im fair skinned) has a yellow beige tone rather then pink which makes ones skin look more natural when using the powder. This is the only powder which stays on during the whole day without need for touch-ups. It promises shine reduction and a matte finish – and it really keeps it promise. It really absorbs oil from my face. The negatives – expensive and you can buy it refill – but is hard to get your hands on. The texture of the cream is smooth and silky, souffle like just as described. This is more of a summer moisturiser not giving enough of hydration to dry skin in rough climates. I actually won this moisturiser in a give-away on one of my favourite beauty bloggers Madeleine loves . I have picked up the hype surrounding this cream from here and there, but never actually tried anything from Philosophy. This cream is for all skin types – which can be a bit worrying (oily and dry skin have extremely different needs in my head no?). I have combined skin (oily T-zone, dry rest of the face) and this cream works good for me during the “not too cold” months and when I use a hydrating serum. I like the souffle like texture which is both oily and light (though a bit separated, watery like ), that it gets absorbed quick and that my skin feels hydrated after use. But this is no miracle cream, and the price is outrageous for what you get. A jar is just unhygienic too. The promise of demise signs of ageing and “rough” texture – I‘m not really sure if I‘ve seen any of that, my skin is well-hydrated but that is all. Also, after I started using this cream my skin has felt more clogged, and I‘ve had more blackheads then usual – I‘m not sure if it‘s due to my diet, other parts of my routine or if it‘s the cream though. Removes all excess oil from my skin. The smell of eucalyptus is a bit too discreet for my taste. I got this mask after too much time in the sun – using all that sunscreen on my face not only caused my skin to break out but also made it oily. Normally I have dry skin so I kind of didn‘t know what to do – switching all my products – which target dry skin – to products for oily skin felt like a bit of an economic pit and unnecessary. Therefore I decided to invest in this mask – which is friendly to a low budget – and see what happened. I like that the mask is easy to apply, and also pretty easy to remove (some mud masks can be hell). It did live up to its promise making my skin look much more matte, and made it feel extremely smooth and soft. About the cleansing part – even though I felt my skin was much softer, it was not by any means cleaner – my blackheads didn‘t disappear at all. So in that sense it doesn‘t do what it promises – but then again, I have never meet a mud mask that does. Overall I was very happy with the results – especially considering the price – now I want my dry skintype back please. I have always been sceptic to loose powder and foundation, thinking that if something is “loose” – it can easily disappear aka won‘t stay on for too long. But this powder has really been revolutionising for my oily, acne prone skin – this foundation covers up great – I have tried a shitton of foundations in my life time and this one is the only one which has covered up my pimples well, and stays on for long (not gone with the wind as I first thought). It is so easy to apply this foundation – its not sticky, its hygienic since one is using a brush. And it gets absorbed very easily. Not all stuff from bareMinerals is magic, read this review. Made my very oily skin less oily. Feels a bit weird using a lotion both for face and body. I have a “problematic” skin, meaning that it‘s oily and I have a lot of pimples. My whole life I have been recommended to use oil-free products for my problematic skin. 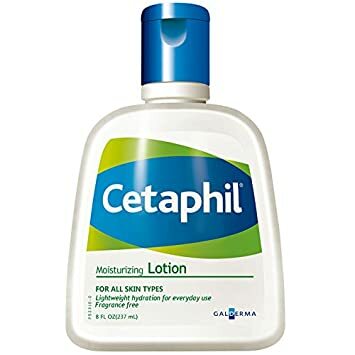 Last time that I went to the drug store, the sales lady encouraged me to try a cream for normal skin instead of the usual oily skin option, and she told me to get this Cetaphil cream (she also told me that all celebreties are using this one which was a plus, cause who doesn‘t want to look like a hot celebrity). I got it, and really really like this lotion. It is very light on the skin being a lotion (and not a cream), you need very little per use, and it is cheap. My skin actually became less oily, which is a miracle since this lotion isn‘t even made for my skin type. After application it doesn‘t leave a thick layer, but gets absorbed very fast and it is perfume free. I actually haven‘t tried it as a body lotion since I‘ve been so obsessed putting it on my face. The negatives about this lotion: it still feels a bit weird using a body lotion on my face, some part of me feels like your face needs more TLC (and anti-wrinkle care) then your body, so I do cheat with expensive serums, masks and an occasional anti-wrinkle cream. The package is nice and has a big mirror. It is like applying dust to my face. After the hysteria surrounding the fantastic foundation from bareMinerals, I got curious. Being provided a discount from my local beauty supplier, I dashed for the powder, full of hope. So what happened? I got robbed and tricked, and now I‘m sad. I really don‘t know where to begin: first and foremost, the sponge that comes with it is useless, a brush really does‘t work either – cause when yo apply It, it really feels like you are applying dust to your face. I almost started coughing when I first used it. It seriously feels like applying dramatic 1800th century white make-up in your face. Everything you wear after applying this powder has to go to the washing machine straight away- since it too, looks all dusty afterwards..Most importantly: it really dries it my skin, which normally is super oily. I even got small dry cracks on my skin after I started using this powder (being very greedy and poor I didn‘t stop after I saw the poor effect but kept putting my skin through this). Also it doesn‘t look natural on at all. December 8, 2014 March 30, 2015 | Anna M.
Doesn’t contain perfume. Removes long lasting make-up. Totally dries out my skin. I’ve never experienced anything like this. Can’t be good for the skin! I’ve had my trouble with oily skin and imperfections. When you’re at that phase of life (read: teenager) where your face is invaded by several huge, red zits that take over your normal appearance, you’ll do anything – seriously ANYTHING – to get rid of the red craters in your face. Therefore, I’ve tried my share of anti acne/oily skin/imperfections products. I have used tons of money to find the product that would magically cure the breakouts and make my skin even in colour and surface. I’m now in my twenties and past those years (thank God), but I still experience some breakouts from time to time. 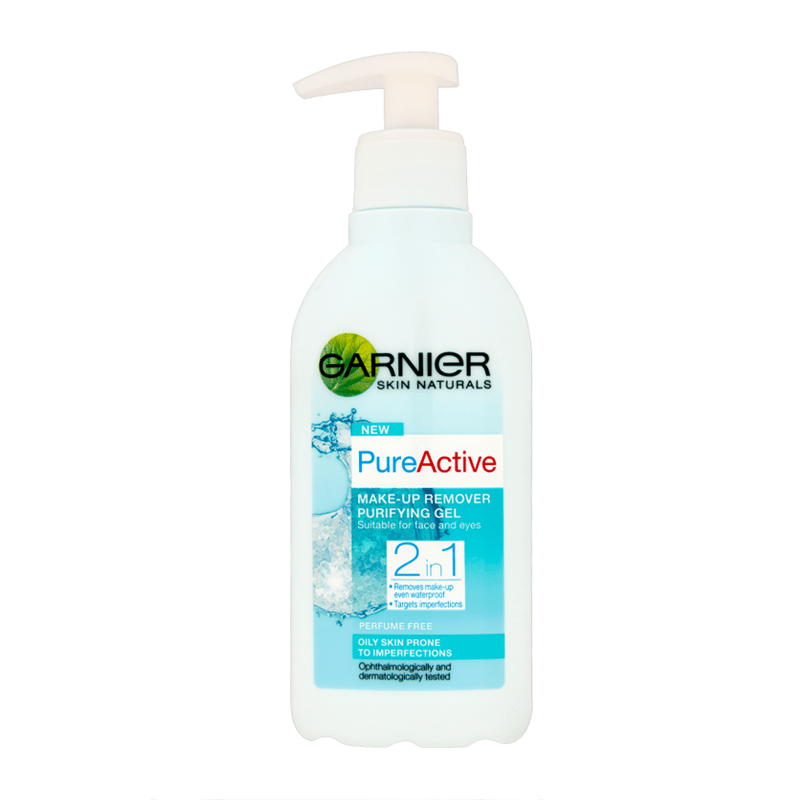 When I stumbled upon Garnier’s Pure Active, I thought: Why not try it out? The section: “Is Garnier Pure Active Purifying Make Up Remover Gel right for me?” confirmed that this product would be OK for my skin even though my skin also has other “characteristics”. I decided that I would use it for cleansing skin when I experienced breakouts now and then. The Garnier Pure Active make-up remover gel dried out my skin like nothing before. My face felt stiff and totally stripped from healthy natural oils. I rushed to my most moisturising facial cream to restore the balance, and I threw the product away immediately. I’ve never tried anything like that. Without being a dermatologist, but having researched the topic, I don’t believe that this remover gel is good for anyone – even if your skin is very oily and filled with imperfections. I’m sure that there’s some products out there that will help regulate the skin and minimise imperfections, but this is not it. Yes it’s cheap, and yes it removes make-up, but that’s about it. I DO NOT recommend this product to anyone!